I’m at Buford Middle School today with Media Specialist Lisa Hallman. We had a great time. Art Teacher Scott Kendrick was instrumental in getting me to the school. 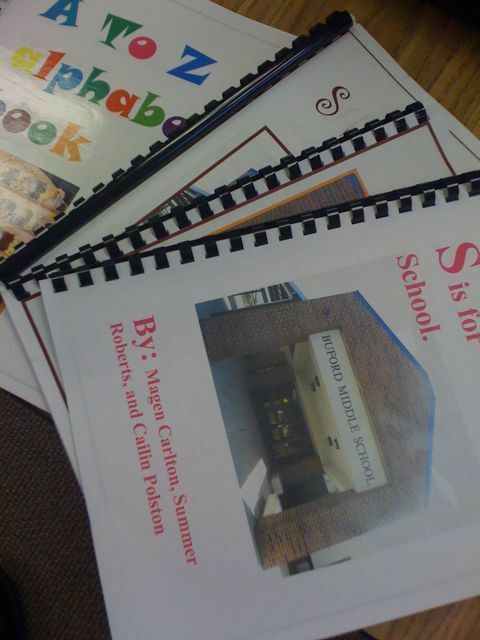 Scott’s students wrote and illustrated cool alphabet books with photographs, which they are going to give to a daycare down the street. 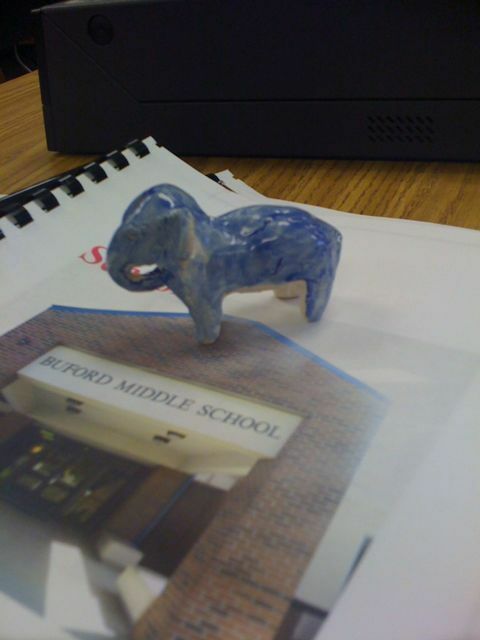 Scott made me a cool elephant, which I’m going to put on my desk for good luck. Last night I had a surprise visit from my good friend (and author) Jerry Pallotta. He was speaking today at a school not far from here and swung by the hotel with Joan Stevens for a late Mexican dinner. It was great to see him and Joan again. You can find out more about Jerry on my favorite links page, but the page doesn’t tell half the story. Jerry and I have been friends for many years and have a long history together. After school I had a whole gang drive me to the airport. I’m headed to Missouri, but the the flight to Atlanta is delayed due to weather, but I think Scott’s elephant is going to bring me luck and I’ll get out of here to catch my connection. Thank you so much for coming to Buford Middle. It was such a treat. You are all the talk today. Students are wanting to know when the next book club will be. It’s music to my ears. Heather you are quite welcome. I had a wonderful time. Please say hello to everyone for me! Thank you for coming to our school yesterday, i really enjoyed your visit. Hey Mr. Smith I read your novel “Jack’s Run” and i really enjoied it! I am a student from Buford Middle School. Thanks for coming. I hope to see u soon!!! Hey this is A’Daija i’m from BMS thank you for coming yesterday. Hey Royland i’m one of the students at the school you visited the other day. I really liked the book Zach’s Lie, we read it in our class room, and finished right before the day you came, also I’d liked to thank you for coming to our school, I’m thinking about reading more of your books, because your books are very interesting. I am Courtney I am from BMS. And thank you so much for coming. I think a bounch of people liked it. I am going to try to get one of your books. It is the one about the kid goes to the moutains. Thank you so much for coming to our school the other day. We all really enjoyed it. You were really funny and so was your story about Billy(the second grader). It was so funny. I love your book Zach’s Lie I really enjoyed it, very creative. Hey Mr.Smith I am a student at Buford Middle School. Thanks for coming and i liked it. I was siting on the front row on wednesday. You were the best author we have had at the school. The best book you wrote is Zack’s Lie thats was my favorite book. It was so asome!!!!!!!! Thats for comeing to the Buford Middle School. Thank you for coming and speaking to us yesterday. I really loved the speech that you gave, it was really interesting. You were the first person that came that was not giving an boring speech. Thanks for coming to our school and speaking to us it was a joy. even though i havent read none of your books and i dont like to read but from listening to you yesterday made me want to read some of your books. I really enjoyed your visit yesterday, you are super funny. hope to see to soon. Hey Mr.Smith, You were awesome yesterday.You are funny too! I love your books. You are my favorite Author! !